Aerohive Networks AP130 Enterprise access points provide a seamless transition to 802.11ac. With more users, more devices, more things, more applications, and strained infrastructure and budget, the AP130 is a powerful option to meet those challenges. Aerohive has built an AP for pervasive Wi-Fi prepared for ultra-high density environments, powerful enough to provide all the services needed for an enterprise network, and inexpensive enough to deploy for ultra-high capacity networks. 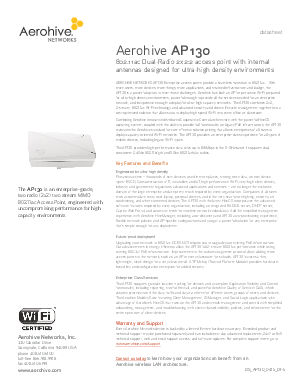 Download this datasheet to uncover the benefits of choosing Aerohive AP130.